Taking Flight: Busy Saturday with New Patients, Barred Owl,Osprey, Phoebe and 4-H Club Community Project and Eagle Scout Project. 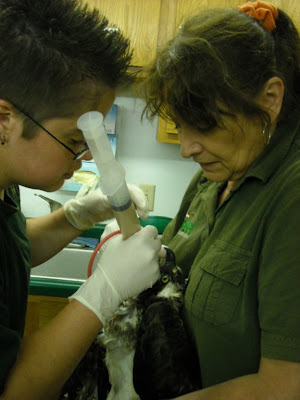 Busy Saturday with New Patients, Barred Owl,Osprey, Phoebe and 4-H Club Community Project and Eagle Scout Project. The day started off with a bang. It was raining. We love the rain but it can be a hazard to some of the fragile birds. We race from one enclosure to the next to make sure everyone is doing well and does not need extra care or supplemental heat. Then there is the normal feeding of babies, checking on critical care patients and returning phone calls that came in during the night that have not already been answered. The "Strasburg Eveready” and “Lucky Rivers” 4-H Clubs and the Master Gardeners from the Antigo Garden Club were here early as well. They did such a great job on the gardens and worked even with some pretty heavy rain showers. 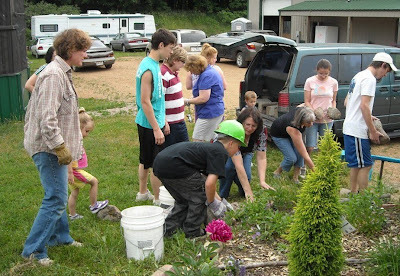 I will do a separate blog entry on the 4-H Clubs and the Garden Club as I want to do it justice. Let me just say the gardens are stunning! Everyone worked hard and with such enthusiasm even with the rain. Despite the warm temperatures the kids got cold when they were soaked to the skin. The rain was suppose to come tomorrow. ::( So everyone dressed as if it was going to be a hot day. The 4-H Club leaders and the kids were all just great. 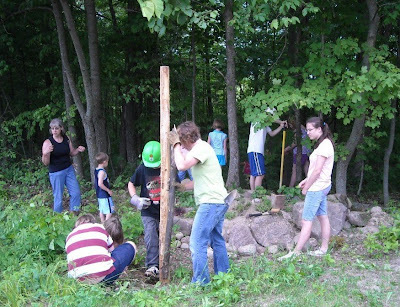 The work was hard as they weeded, carried huge rocks and hauling pails of mulch to finish up the gardens to perfection. Many thanks to each and every one that was here today. 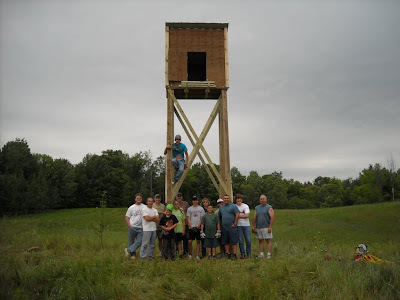 Joe Lex and Boy Scout Troop, #644 arrived about noon to construct Joe's Eagle Scout Project. They arrived just as the other group left. The rain was still coming down as they got the heavy equipment into the field and began to plan the construction of the Turkey Vulture Nest Box. We have had this project on our "wish list" for eons and were just delighted when Joe and his dad came to inquire about it for Joe's Eagle Scout Project. 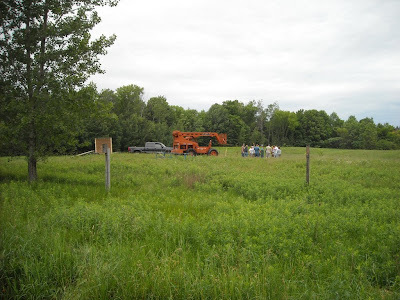 It is a large project and took lots of help from many people to bring it together and get it up in the field. I will also so a separate blog on this fantastic project. Suffice it to say that it was worth the wait to have such a great final product. Thanks so much to everyone that participated and to Joe for having the inspiration and developing the project. Late afternoon we received several birds. 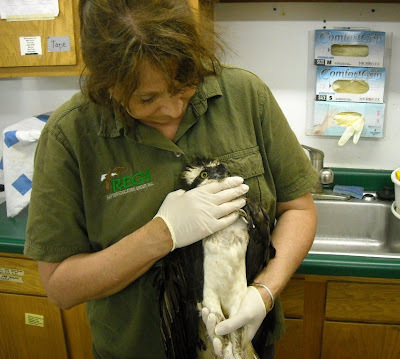 One was an adult Osprey from a nesting site in Wausau. Unfortunately there are young in the nest still. I am not sure what the loss of the parent will mean for the nest. The other concerning thing is this Osprey is starving and should not be as there are plenty of fish around to sustain her and the family. There is an underlying problem that we are investigating at this time. Things we are testing for will be lead poisoning, other toxin and parasites. Off for tonight. Tomorrow comes early and I still have final feedings to do before I can sleep.